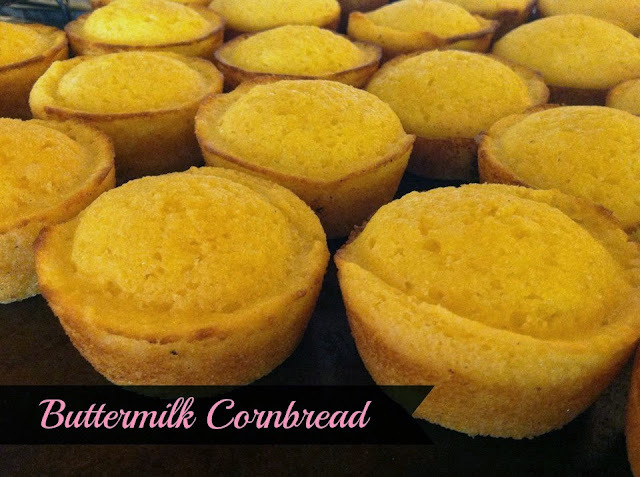 Many times when I try a cornbread recipe the cornbread comes out very dry and kind of gritty. I must not like "true southern" cornbread, because I like mine sweet and buttery. Honestly, I really love Jiffy's cornbread! I tried this recipe from allrecipes.com and I am very pleased with how it turned out. The original recipe calls for putting it in a greased 8" square pan, but I was able to make 12 muffins in a greased muffin tin. I used a 1/4 cup measuring cup to make sure the batter was divided evenly among the muffin tins and it worked out perfect. When they came out of the oven I brushed the tops with melted butter and they were melt-in-your-mouth delicious! Melt the butter in a mixing bowl. Add the eggs and beat until blended together. Combine the buttermilk and baking soda in a measuring cup. Pour into the butter mixture. Stir in the cornmeal, flour and salt until well combined. Pour among greased muffin tins or a greased 8" baking dish. Bake for 20-30 minutes, depending on which way you baking them, until the center is cooked and a toothpick inserted in the center comes out clean. Remove from the oven and immediately brush with melted butter, if desired.